Stuffed peppers are adorable. There’s something about one thing making a cute little cubby for other things that just does me in. It’s like that cat wearing a lime hat or a kangaroo pouch…but edible. Sourdough bread bowls, deviled eggs, egg-in-a-hole, you know what I’m talking about. But vegan stuffed peppers might be my favorite. You can make them a million different ways – filled with quinoa, corn, beans, and spices (like this recipe) or even pick a regional theme (Italian, Romanian, Lebanese, Russian, Mediterranean. If I had to describe this stuffed pepper recipe, I’d put it close to a Mexican stuffed pepper. I made these for a dinner with a good friend recently and they promptly all disappeared that night. They’re hearty, filling, completely plant-based, and easy to make. Vegan cooking success. how do you make vegan stuffed peppers? Cook your quinoa. While that’s in progress, prep the peppers by halving them, scooping out the seeds, and lightly brushing with oil so they don’t burn in the oven. Once the quinoa is ready, add it to a mixing bowl with the other ingredients – corn, black beans, and spices–and spice to taste. 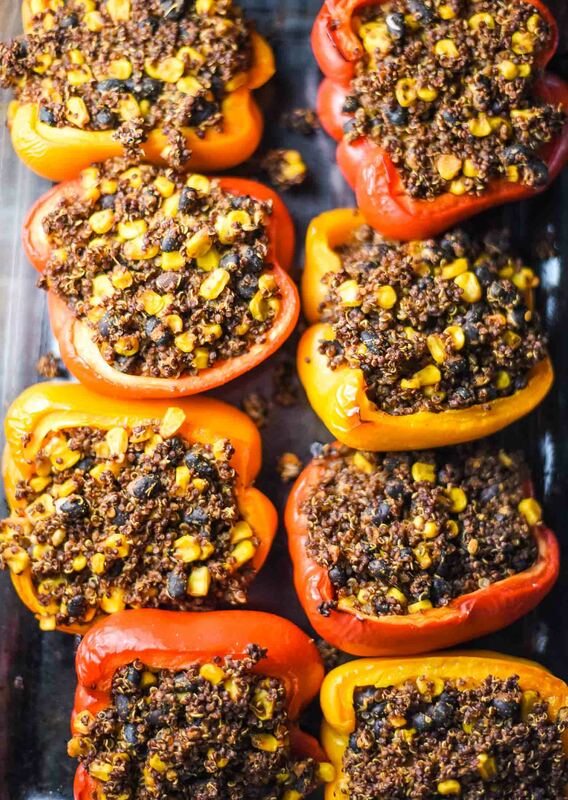 Generously fill the peppers with the quinoa mix, cover your baking pan with foil, and bake for 30 minutes. Take the peppers out of the oven, remove the foil, and return them to the oven for an additional 15 minutes. While your peppers are baking, make the avocado sauce. Once the peppers are finished, let them cool a bit before serving. Add finely chopped red onions and avocado sauce on top, along with hot sauce and any other toppings you’d like. 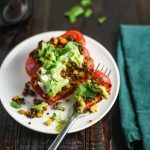 This vegan stuffed peppers recipe has a lot of small steps but the most time consuming part is waiting for your delicious meal to bake. what are the best ingredients for stuffing peppers? This recipe calls for quinoa, salsa, corn, black beans, and loads of delicious spices. If you’re looking for alternative recipe ideas, you could try stuffing your peppers with marinara sauce, zucchini, brown rice, walnuts, olives, and broccolini for an Italian twist or kale, parsley, mint, pine nuts, currants, and potatoes for a Greek-themed dinner. Part of the reason that stuffed peppers are so appealing to me as a recipe is that almost every culture in the world makes a variation of this deliciousness. When you see the repetition of a recipe theme despite cultural differences, you know you’re on to a good thing. what do I serve with these vegan stuffed peppers? Got you covered. This recipe includes avocado sauce which adds complexity to the spicy, smoky profile of the peppers while also making it easier to eat (without a sauce, it could be a little dry). Secondly, chopped red onions are delicious with this, as is fresh chopped cilantro and hot sauce (if spicy is your speed). Lastly, you’re going to want a glass of…wait for it….yup, you guessed it. Wine. Pair this meal with glass of wine and I promise you’ll be crowned dinner champion. Looking for more hearty plant-based recipe ideas? Check out the vegan burrito bowl, vegan stuffed shells, tali sauce vegan bowl, vegan baked ziti, vegan meatballs with spaghetti, or black bean bowl with plantains. 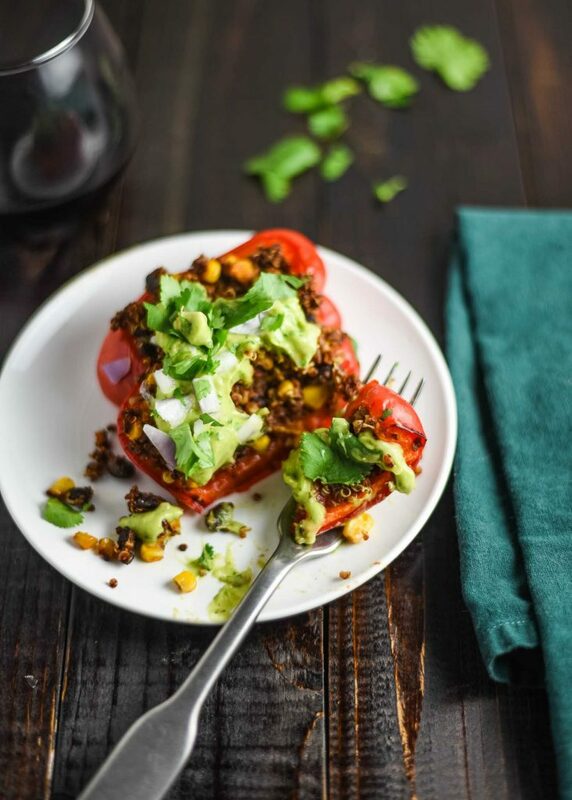 If you make these vegan stuffed peppers, leave a comment, rate the recipe, take a picture, and tag it #plantandvine on Instagram. Malbec: red plum, blackberry, vanilla, and cocoa flavors, with a full body and medium tannins. It won’t battle the spices and Malbec is usually a crowd pleaser. Decant for about 30 minutes before serving for a delicious pairing. Zinfandel: fruit-forward and bold red, with flavors of blackberry, strawberry, cinnamon, and sweet tobacco. It will give you the fruitiness to complement this recipe while also introducing its own subtle spice. Cabernet Sauvignon: this was my pairing for the evening. I initially thought Cabernet might be too strong, but this dish is hearty and the Cab’s rich, ripe dark berry flavors complement it well. If you’re interested in learning more about how to pair wine with vegan recipes, check out my wine pairing and vegan wine guides. Already have a bottle? Get the scoop on how to decant it with the best wine decanters. 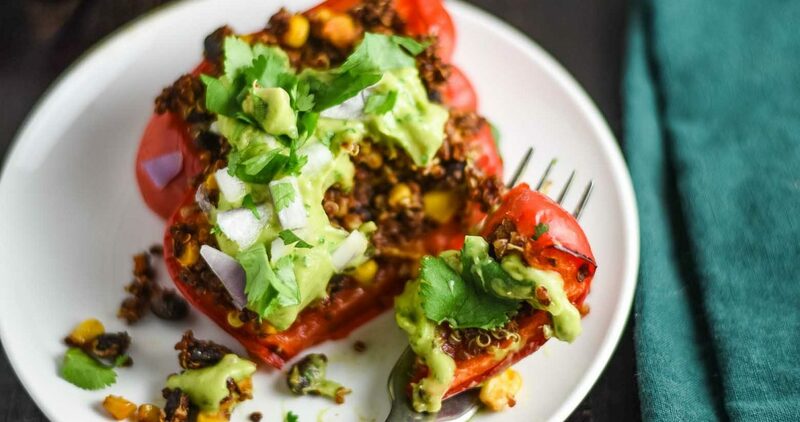 Delicious and simple vegan stuffed peppers recipe. A hearty, plant-based meal that will fill you up and leave you feeling satisfied. In a saucepan, add quinoa and vegetable stock and bring to a boil over high heat. Once boiling, reduce heat, cover, and simmer until liquid is absorbed – about 20 minutes. Once quinoa is finished cooking, remove it from the heat and fluff with a fork. Preheat oven to 375 degrees F. Lightly grease a 9×13 baking dish with a neutral, high-heat oil. 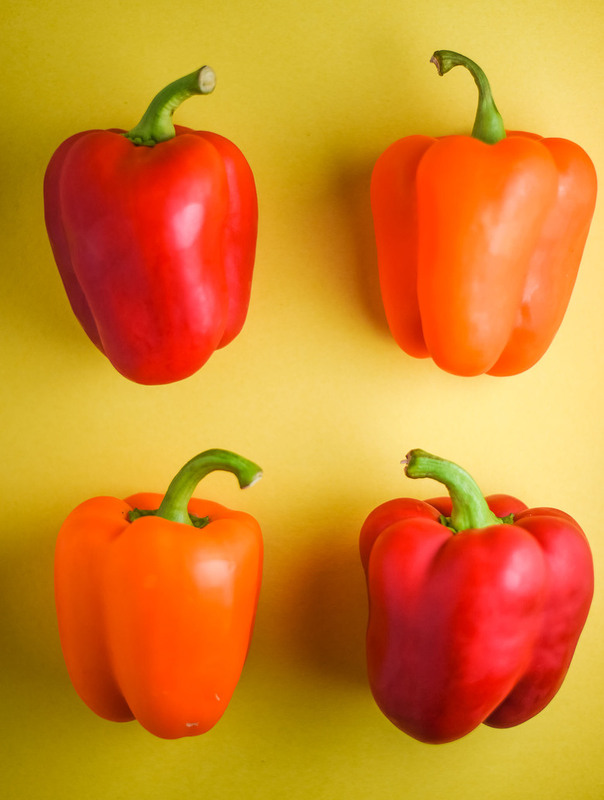 Brush halved and deseeded peppers with a neutral, high heat oil, like grapeseed or avocado oil. You want to brush all surfaces inside and outside the pepper so it doesn’t burn. Add cooked quinoa to a large mixing bowl and add the salsa, garlic, nutritional yeast, cumin, oregano, chili powder, black beans, and corn. Mix until evenly combined. Taste and adjust seasonings accordingly, adding salt, pepper, and other spices as desired. I added salt and pepper. Generously stuff halved peppers with quinoa mixture until peppers are full, then cover the dish with foil. Bake for 30 minutes covered. While peppers are baking, make your avocado sauce by combining all ingredients in a food processor or Vitamix and mixing until smooth. Remove from oven and remove the foil. Increase heat to 400 degrees F and bake for additional 15 minutes, or until peppers are soft and slightly golden brown. Depending on how browned you like your peppers, you can bake up to an additional 30 minutes here. Top with suggested toppings and serve. Best when fresh. Store in covered container in the fridge.